The DA Young Leaders Programme is deeply grounded in the DA’s vision for South Africa. The Programme seeks to develop and grow our country’s future leaders responsible for upholding this vision of One Nation with One Future, and our core values of Freedom, Fairness, Opportunity and Diversity in politics and government. In the DA’s South Africa, all individuals will have the opportunity to live a life that they value. This South Africa is dynamic and innovative, with a growing, inclusive economy and capable government which defends the Constitution and ensures equal opportunity for all – regardless of where they are born, how they look, or any other arbitrary characteristic. You can learn more about the DA’s dream for South Africa here. We know that South Africa will need excellent leaders to realise this dream. The Young Leaders Programme is an intensive, year-long, part-time political leadership development course, known around the world as the gold standard in political development. The Programme strives to give passionate, young South African leaders the opportunity to develop themselves to their full potential, irrespective of their background. To learn more about what the Programme is all about, you can also have a listen to what our graduates have to say about it here. You can also meet the Young Leaders Class of 2019. Click here to download their profiles. The DA’s Young Leaders Programme (YLP) is a political leadership learning and development programme for South Africans between the ages of 18 and 35 who align themselves with the DA’s values of Freedom, Fairness, Opportunity and Diversity. Participants of the programme are highly motivated individuals, interested in pursuing a career in politics or the public service, with the aim of creating One Nation with One Future. Over the course of one year, participants of the programme will be given the chance to broaden their political knowledge, critical thinking and communication skills. Participants will also get to know themselves, and their personal leadership style and development needs a lot better during dedicated sessions on leadership and personal development. In addition, Young Leaders will be required to conceptualise and undertake a leadership project, giving them a unique opportunity to expand their influence, self-awareness and emotional maturity, so that they can become dynamic, resilient leaders who are able to tackle politics on the national stage. What do we look for in a potential Young Leader? Young Leaders are individuals who are already making a difference where they are. They are known for the values and principles they live by, and are committed to not only bringing about change in their communities, but to also growing and developing their own potential. Our Young Leaders are able to align their own personal value set to the DA’s liberal values, and are passionate about working hard towards a better South Africa, considering politics and government as a serious career option for their own future. Young Leaders are innovators and dreamers. They are never complacent or content with how things are; they are always aspiring to greater heights, rising to new challenges, and willing to learn more. The YLP is carefully designed to develop an entire set of competencies in order to grow a pool of knowledgeable, articulate, emotionally intelligent and resilient leaders who can one day lead the DA at a national level. These competencies include a wide range of practical and philosophical knowledge of politics, critical thinking and communication skills, as well as a high level of self-awareness and resilience over the course of one year. Young Leaders will also enjoy a high level of interaction with senior leaders in the DA. The YLP is a part-time course, allowing participants to continue with their normal occupation while on the programme. It runs annually from February to November. That said, the Programme is rigorous and time consuming in terms of its requirements and assignments. During the course of the year, the entire Class of Young Leaders will meet for five weekend-long retreats. In between retreats, Young Leaders should be prepared to commit time out of normal work or study hours to complete programme assignments, meet with mentors and leadership coaches, as well as develop and manage a leadership project in their communities. Will I be able to work/study full-time and participate in this Programme if I am selected? Almost all Young Leaders either work full time or study at a tertiary institution. The YLP is a part-time course, and can fit into participants’ schedules, but will require effective time management and planning. We recommend that applicants give serious consideration to their workload and current obligations prior to applying for the Young Leaders Programme as the programme is a serious and time consuming commitment. How do the Retreats work and must I attend them? During the course of the year, Young Leaders meet for five weekend-long retreats that usually take place from Friday morning to Sunday afternoon. These retreats are the backbone of the programme and are carefully designed to give participants the opportunity to not only learn from a range of political experts during interactive sessions, but to also learn from one another. Retreat dates are provided at the beginning of the programme year and attendance of entire retreats are mandatory in order to graduate from the Programme. How will I get to the Retreats? Before each retreat, participants will be notified of travel arrangements. As retreats generally take place in the Western Cape or Gauteng, the DA will make all travel arrangements for Young Leaders who live outside of these provinces so that they can travel to and from each retreat. At the start of the Young Leaders Programme, Participants will be required to conceptualise their own Leadership Project, and to then execute this project during the course of the Programme year. The successful completion of the Leadership Project is a requirement for graduation from the Young Leaders Programme. All costs directly related to the YLP are covered by the DA. How many Young Leaders are selected? A national group of approximately 15-20 Young Leaders are selected annually. The YLP is open to all young South African citizens between the ages of 18 and 35, with a track-record of leadership excellence. These applicants must share the DA’s vision and must have proven themselves to be passionate leaders set on making a difference in South Africa. Participants must either be living in South Africa, or if they are temporarily abroad, be returning to South Africa in time for the start of the programme. The Young Leaders Programme does not cover international traveling costs. Do I need a tertiary qualification to apply? There are no specific qualifications required in order to apply. The YLP is open to all South African citizens between the ages of 18 and 35. I am turning 36 in 2019, can I still apply? Applicants must be aged 35 or younger when they start the Programme at the first retreat in February 2019. Applications which do not adhere to this criteria will not be reviewed. I am turning 18 in 2019, can I still apply? Applicants must be aged 18 or older when they start the Programme at the first retreat in February 2019. Applications which do not adhere to this criteria will not be reviewed. Can I apply for the Programme if I have previously applied but was not successful? Yes. Applicants may submit one application per year, even if they have unsuccessfully applied in the past. Can I apply for the Programme if I have already participated in another DA leadership programme? Yes. The YLP is distinct from any other provincial or local leadership programme hosted by the DA, or any other organisation. Do I need to be actively involved in the DA in order to apply? While political involvement will definitely serve to strengthen your application, it is not an absolute requirement. The Young Leaders Programme seeks candidates who believe in the DA’s vision, and who can illustrate a track-record of leadership involvement. Applicants will receive an automatic system email confirming they submitted a form online. Applications are reviewed by the Young Leaders Office and applicants will receive a confirmation email within 48 working hours, indicating whether their application package is complete or incomplete. If you do not receive this confirmation, please contact the office. All applicants who have successfully submitted a complete application package will be required to complete a 2-hour long online test between 6 and 9 September 2018. Assessment test opens on Thursday, 6 September and will close on Sunday, 9 September 2018. Shortlisted applicants will be invited to an interview. Selection Process continues. How do I contact the YLP Office? The preferred method of communication is e-mail: youngleaders@da.org.za. Alternatively, you can call the Federal Head Office at: 021 465 1431. 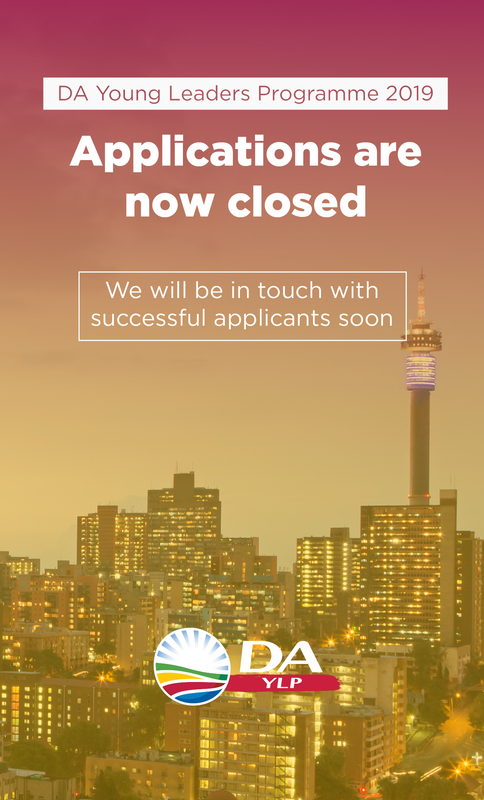 Applications for the DA Young Leaders Programme 2019 are closed. The 2020 DA Young Leaders Programme applications will open in August 2019.